Forest habitats contribute more than any other terrestrial biome to carbon cycles and processes. It is believed that more than half of Earth’s terrestrially stored carbon is stored in the trunks, branches, foliage, roots, and soils of forest ecosystems. Given their importance as carbon sinks, there is an increasing urgency within the scientific community to understand and quantify total carbon sequestration in various forest habitats, and in forests of similar attributes but of varying age. In 2001, a partnership between academia, Canadian government agencies, and the private sector installed a 20 m (65 ft) flux tower in a 13-year-old Douglas-fir stand on Island Timberlands property on Vancouver Island, British Columbia. The installation is part of a long-term, Douglas-fir chronosequence study of harvest-cycle productivity. 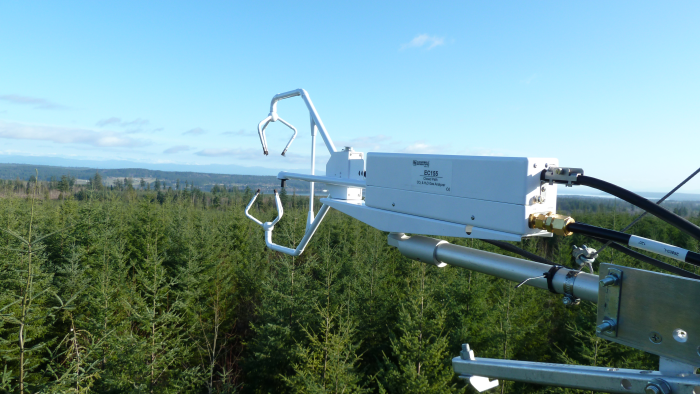 Scientists from the University of British Columbia have been continuously monitoring carbon sequestration using eddy-covariance (EC) techniques since 2001. In 2002, the research site became part of Fluxnet Canada and was included in the Canadian Carbon Program in 2007. The Fluxnet Canada Research Network/Canadian Carbon Program was a national research network of university and government scientists who studied carbon cycling along an east-west transect of Canadian forest ecosystems. A Campbell Scientific CR23X datalogger has been in ongoing use for climate measurements at the research site. With significant recent advancements in EC flux measurement technology, such as closed-path EC systems, which are particularly well-suited for moist, temperate-forest environments such as western British Columbia, complementary projects have been initiated at the site. In 2011, researchers installed a Campbell Scientific CPEC200 closed-path EC system, including the EC155 closed-path gas analyzer and a CSAT3A sonic anemometer. The CPEC200 was designed to be a completely integrated, low-power EC system, which is easily installed, provides long-term measurement stability, and features automated zero and CO2 span. The Campbell Scientific equipment will contribute to an intercomparison of data collected from various sensors as well as CO2 fluxes collected from autochamber measurements on soil, trunks, and branches. Continued year-round measurements will help scientists understand how carbon sequestration and water use varies with age and height of forest stands, as well as human-induced perturbations such as the application of fertilizer. This data will contribute to a body of knowledge that will help scientists better understand the temporal and spatial carbon cycles of these habitats and has been made widely available through the Fluxnet Canada Research Network.